(April 13, 1945) - Word has been received by Mr. and Mrs. Vito Frank Liloia of Passaic avenue that their 21-year-old son, Pfc. 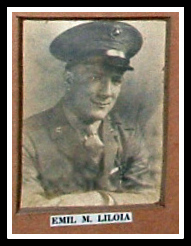 Emil M. Liloia, USMC, was killed in action March 1 on Iwo Jima while serving with the 3rd Marine division. Pfc. Liloia entered service Feb. 6, 1942, taking his basic training at Parris Island. He later was stationed at Philadelphia, guarding prisoners. When sent overseas a year ago, he first went to Hawaii and then to Iwo Jima. Born in Belleville, Pfc. Liloia came to Nutley when he was three. He went through Nutley schools and while in high school starred on the football team. As a result of his activities on this team an as a basketball player he was voted the best athlete of the year. Upon high school graduation, he received a scholarship to Temple university in Philadelphia and had played there only one year when he went into service. Pfc. Liloia has four sisters, Ann, Ruth, Marie and Dorothy. A brother, SK 3/c Pat Liloia, has been in the Navy two and one half years and is at present on an oil tanker in the South Pacific.